Imagine a lovely drawing of a house with a path meandering up to it, trees either side in careful balance, a classic landscape scene that just ‘works’. Where is this masterpiece? The Tate? The National? No, stuck to your fridge door, created by a 4-year-old. As a young child, visual harmony and composition comes naturally. Children seem to start out with a near perfect sense of composition if you have small children or are lucky enough to have any of your old drawings you created as a child I’m sure you’ll find the same to be true. Younger children see the edges of the paper as a whole frame to fill, and they often fill them with a great sense of balance. When you start to grow up, you know – really old like 9 or 10, that’s where the drawing problems start. The focus shifts and is aimed away from composition to the pursuit of something far more important, where the accolades are huge and respect even greater, the quest for the ultimate prize …… realism. The importance that was once placed on the edges of the page, the ‘wholeness’ of the piece are disregarded in favor of singular objects, and the representation of these objects as accurately and as detailed as you can possibly make them. The prize is no longer for composition, a 10-year-old doesn’t care, the focus is on accuracy and realism especially ‘hard things to draw’ like hands or faces. But the ultimate goal, the real award winner is this….If you can draw a crumpled can of Coke realistically you are king of the art room. Once you have diverted from the path of composition in childhood it is hard to get it back, and you will have a natural tendency to place objects in the centre of a piece, this is due to the strong symbol systems formed in childhood. 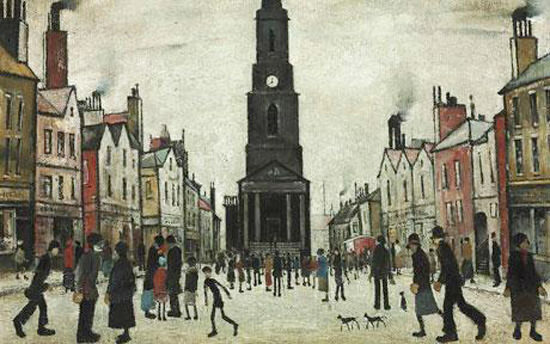 Lowry embraced this simplistic quality resulting in his paintings looking childlike. It is not only through the handling of the paint, but the composition of his painting where everything is biased towards the center. If you want to make the jump towards a more sophisticated composition there are a few things to consider. A format is just another word for shape, and this comes down to personal preference. From squares, rectangle, panoramic. The easiest shape to create a balanced composition is a rectangle, just like an A4 piece of paper. The rectangular format: this is an absolute classic and extremely flexible format. When a rectangle is displayed with its shorter side across the top it is known as ‘portrait format’ and with its longer side across the top ‘landscape format’. The square format: This can work extremely well or very badly. You very rarely see a square old master painting. This is because it is harder to balance a painting that has lots of elements within, for example, a collection of figures in a landscape within a square format. It can look awkward very easily. However, using a square format for a more contemporary subject, an abstract or a minimalist seascape, can be very effective. Make sure the shapes, spaces, and gaps between objects are all different. Composition can be confusing and hard to pin down, you don’t really notice good composition in a painting it is just there, which is why it is one of my 7 principles of painting . The dictionary definition above doesn’t necessarily help us. ‘the action of putting things together‘ well, this is true but the actions of putting things together so they ‘work’ is harder to explain. If colour mixing is about relationships, the warm to the cool, the bright to the muted then composition is about variety- busy to calm, large and small. Don’t make any two things the same. If you’ve got a row of fence posts going into the distance – check the gaps, they should all be different. If you have a simple still life with a jug and some fruit – check the heights, they should all be different, check the width, they should all be different. This seems very straightforward, and it is. It is just a simple way of analyzing your initial set up. Is this method true for all paintings? No, but the more you look, the more you will notice this to be true. 1. Divide your page horizontally into 3. 2. Decide whether to have your horizon on the top third or the bottom third (the bottom third is always easier to balance, it helps to make the sky look vast and imposing). 3. 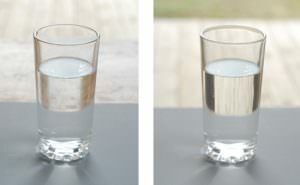 Split the vertical into thirds. 4. Align areas of focus at the intersection between the lines. 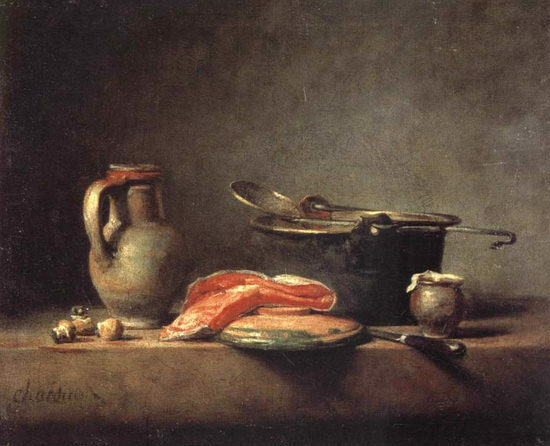 You can see in the Chardin painting above how there are numerous examples of aligning objects within the rule of thirds, the top of the jug aligns with top horizontal line and sits butted up to the vertical line, even the top of the funny little pot on the far left side sits on the bottom horizontal line, to name a few. Pro tip: If you have a Mac, iphoto does all the work for you. It can change the size and the rule of third lines are already on the screen for you. Align, resize, repeat. Your digital camera probably has a viewfinder function built in, often called grid. It again overlays the rule of thirds over your image, just align important compositional elements along these lines or their intersections and voila… instant painting. Rule of thirds can work very well within a rectangle, however, for landscapes squares can be harder to create a balanced painting even when sticking to the ‘rules’. If you put the principle of ‘no two spaces the same’ with the ‘rule of thirds’ you can create pleasing compositions very easily. If we analyze the quote below by Sir Joshua Reynolds we can see how both these points are touched upon. Classical paintings had a very scientific and structured approach, with lots of confusing things like root rectangles and golden means. They are often more mathematical and planned out than you would ever imagine….whooahh there, we are moving into complicated classical territory which deserves a proper explanation, which I will address in a future post. The key point to remember with composition is about variety – just as Reynolds says ‘Unequal parts and gradations lead the attention easily from part to part’ so add variety in your pieces and start with a rectangle canvas. This article has helped a tremendous amount. I’ve always understood the principles of composition but to read it as you have described has given me a much greater understanding. I actually got a pen and paper and made notes! Is there a mailing list to be notified of any new articles on this site? Your site is in my favourites and I’ve already subscribed to your YouTube Channel. Hi Jay, Glad you’re enjoying the articles. You can sign up to the RSS feed in the top right of the page and will be adding an autoresponder in the next few weeks. I tend to put on a new post every Thursday of Friday. 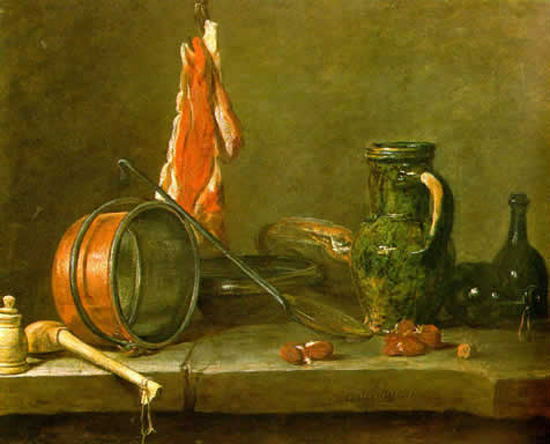 Kind of your to say so, yes, the hidden rules of composition are fascinating, especially in Old Master paintings there was often a very precise system to the compositional elements of the piece. P.S Thanks for signing up to the drawing course, looking forward to helping you discover more about the principles of drawing. Thanks Will , as said before I’ve read a lot about forming compositions, but you added valuable information to what I had. Pleased to hear it Naima. Will, what can I say that’s not already been said..about your insight….I’m a self taught artist that finds myself blocked for the first time in ten years. I’ve been painting in watercolors and have recently started painting with acrylics. I found my paintings lacking in composition….Also I tend to want to paint landscapes in portrait format. Any tips on landscapes in this format would be cherished. Hi Monica, pleased the article helped. When working in the portrait format for landscapes I always favour a rough 2/3 sky to 1/3 land. If the horizon line starts to creep too much towards the centre of the piece it can sometimes feel a bit odd. Much thanks, that’s exactly what happened, the horizon just kept creeping higher up the canvas to the center and it does look odd. I’ll pull it back down to the 1/3 . Again much thanks for sharing your wisdom. Cheers Falak, pleased you enjoyed it. Very kind of you to say so Cliff, great to hear you found the article on composition helpful. Thanks so much for this great article Will! Do you know by chance of any good books on children’s natural talent for composition. 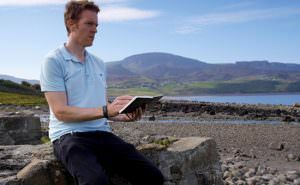 Hi Tom, pleased you enjoyed the article, I can’t think of any specific books on the subject of children’s natural talent for composition, if you come across any it would be interesting to know. Hello Will, Thank you for an interesting article. Are there any composition rules that comic book artists could apply to their work that is different to what you have outlined above? I ask as I am currently ‘drawing’ a Lego strip for my website. I use Lego minifigs, buildings and clipart. There is no drawing as such, I use pose the figures and take photographs. So probably this question may not apply here! The aim is to see if I can create a comic strip using Lego and produced in a comic book style. I’m not sure I have a correct understanding of what composition is. The strip is for my own enjoyment, but I’m inflicting it on an unsuspecting world via my website. Thank you. Hi Adrian, yes, for creating narrative storyboards etc there are different approaches you can take to create movement in your compoitions. You might find this book of interest. Drawing and composition for visual storytellers. Hi Will, my first time here. I have been putting off going to art classes for some strange reason, though I love to draw and paint. Must be an age thing. However your site may be the answer for me. How you relay your instructions and thoughts here is keeping me motivated to actually learn the necessary processes of drawing and painting. I am impatient and lack direction and structure but find myself very interested here !!! looking forward to reading more . Thanks, Rosie. Take the lessons a step at a time and you’ll achieve some fab results. This week I’m going to be doing a simple tonal drawing that you might be interested in, enjoy discovering! Just found your site tonight….very informative, very articulate, most all enjoyable . I will look forward to hear/seeing more about the use of the golden mean in composition or classical and current art design. Thanks Leah, hope you’re finding it helpful in your compositions. Composition, even just taking a few minutes to plan it, can be so valuable to a picture or a painting. Thank you Will for all your great resources! This was extremely helpful. I was looking for juxtapositioning methods when I came across this and it gave me a whole new perspective. ThanX a bunch! Excellent article!! Thanks so much. I have my sketch book in front of me taking notes! I’m planning my still life at the moment and this has really helped!! Thanks Katie, glad it’s got you inspired with your sketchbook. Thanks Joe, pleased you’ve been finding the teaching style suits you. I am enjoying your website immensely. I am also very happy that you take the time to answer each individual who addresses you. I do have a question. 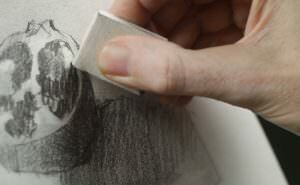 I can “draw”, as I do realistic graphite portraits, but cannot paint. Do you think I should start with your drawing course since I’ve never had any formal training in this area, so I don’t know the “rules” about composition, color theory, none of it, but I can draw. Where would you suggest I begin? Nice to hear from you and pleased you’ve been enjoying the website. If you can draw already you can go straight to the beginners painting course, you might find the beginners drawing course a bit too basic, but is does cover approaches to composition and techniques with graphite (such as a tonal ground) that are then echoed in the painting techniques. You can see a recommended progress through the courses here. Thank you so much for your well written article. It has helped me to construct a much more interesting painting. Pleased you found it helpful Anne. Cheers Anthony, glad you enjoyed it. Always get loads of information from your posts. Thanks Will. I loved the information, really gave me a new scope to look at. Pleased you enjoyed it Gabrielle.